Sweet cherry picking has started! To encourage lots and lots of u-picking, we are rolling back our u-pick prices to 2006. Bring the whole family out to the orchards for good fun and great fruit. We have a gorgeous crop of both sweet and tart cherries (another 5-6 days before tarts are ready), and from the looks of it, well have u-pick available throughout the rest of July. Hope to see you out there! The U.S. 31 Market is now open and fully stocked. We have the bakery going full blast with a new baker named Rhonda. We are right on the verge of Sweet Cherries, and the trees are loaded! John took us all on a crop tour last week to show us all the crops and how well there all doing. Everything looks wonderful, plentiful and just around the corner. For the weekend, we'll have local strawberries and Michigan sweet cherries in both markets, along with plenty of homemade pies & cookies and our full line of Montmorency cherry products for sale. Stop in for a cup of coffee and visit. We would love to show you the farms. p.s. Visit our "Orchard Talk" blog for regular crop updates. Happy Holidays from King Orchards! We'll be here for the next few days, happy to assist with apples or last minute gift ideas. It's both a colorful and plentiful time at the orchard. We're getting into peak apple season... the crew is picking beautiful, large Honeycrisp apples, McIntosh, and Galas this week (U-Pick is Open for them, too). Empires, Cortlands, Jonagolds and Mutsus should be ripe for picking within the next 7 days or so. We also have Bartlett pears and Stanley plums, as well as pumpkins, gourds, and squash for sale in the markets, and Rose has been keeping busy dipping caramel apples and baking plenty of pies. We've also started our apple gift box shipping. Macs, Honeycrisp and Galas started shipping this past Monday. Mutsus & Empires will start going out around the 13th. Give us a call toll-free at 877-937-5464 if you'd like to place an order for yourself, or as a special Michigan treat for customers, friends and family. Next weekend (October 10-13) is the Charlevoix Apple Festival. We'll be bringing plenty of apples, caramel apples, cherry treats, and bakery goods. Hope to see you there! Red Haven peaches and nectarines are ripe and ready for picking. Pick your own for $15 per 1/2 bushel, or pick them up here in the markets for $16 per 1/2 bushel. It's peach time! Pick your own peaches for $15 per 1/2 bushel, or pick up some already-picked for $16. We're starting with the Garnet Beauty, a juicy, flavorful semi-free stone peach. Red Havens and nectarines usually follow 5 to 7 days later, so look for those around the 17th. We're still picking apricots and raspberries. Our fruitstands are full of fresh, delicious fruits and vegetables this week. We have tomatoes, white and red Michigan potatoes, sweet onions, Sugar Baby watermelons, and canteloupe (the best ever!) from Bay City, locally grown green beans and dill, plus our own zucchini, sweet cherries, Balaton cherries, apricots, yellow plums, red plums, and sweet corn. Please see our Fruitstand Page for pricing. U-pick is closed for the season for cherries, but we still have pick-your-own apricots and raspberries. Have a great weekend! It's Prime Time for U-Picking! I'm calling it the Trifecta of U-Picking. We have sweet cherries, tart cherries and raspberries all ripe for the picking this week. Pick your own tart cherries: You can pick your own tart cherries right from the tree and we will wash them and pit them for you. This year they are $1.00 a pound. There is a flat $6 fee for washing and pitting. Pick 25 pounds or more and the pitting is free. Still Picking Sweets: The sweet cherry picking is really great right now. You can pick dark sweet (Bing) cherries for $1.75 per pound, and light sweets (Rainier or Queen Anne) for $1.25 a pound. Picking Raspberries: We also have raspberries ripening and turning deep red in the warm, summer sun. You can go out to the patch and pick your own for $4 a pint. You can also pick up some wonderful blueberries in the markets this week. They are $4 a pint, $7.25 a quart, or $20.00 for 3 quarts. And of course, we have real-homemade-real-fruit pies from our bakery. Sounds like the makings of a great weekend! The black sweet cherries have been slow to ripen but we are finally there! Sweet cherries are in the markets by the quart. U-pick will open on Wed 7/9 at the M-88 farm. The picking will be much easier towards the week-end. Price for u-pick is 2.00/lb up to 25 lbs and 1.75 over. Raspberries are ripe for u-pick. Come out and enjoy the farm. Cherries will be in for about 2 weeks. Tart cherries ripe about 7/16. Happy harvesting! Strawberries are finally here! The strawberries look absolutely wonderful and delicious. They taste just as great as they look. The prices of the strawberries are set at $4 a quart and $30 a flat (8 quarts). The season should last through July 7th or so. 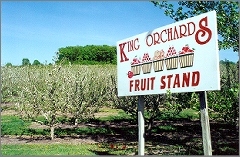 Join us for "Orchard Talk" at our new King Orchards Blog! Our King Orchards blog is now live. This week, John has been blogging about his seed and tree purchases for this year's plantings. Rose, Betsy and I have been sharing cherry recipes and new, creative uses for cherry juice and dried cherries. Frank's been perfecting his back flip on skis; you can watch the youtube video from our blog. Fox Business News did a story on the Choose Cherries campaign and the antioxidants in tart cherries. We've embedded that video, too. We still have a lot to learn, but we're excited about the new possibilities for interaction and customer feedback that blogging allows. If you have suggestions, ideas, or testimonials you'd like to share, feel free to add your comments to our postings, or visit the "Customer Feedback" section. We look forward to hearing from you! February is National Cherry Month, and King Orchards wants you to help us celebrate! During the month of February, e-mail me your favorite way to eat dried cherries and I'll send you a sample of King Orchards dried cherries as a thank you. You say you've never tried dried cherries? That's easy to fix! Just email & tell me you want to try a sample and I'll send you one. Send your email to betsy@kingorchards.com with the subject Dried Cherries. If you're looking for ways use cherries, we have a great cherry recipe section on our site! I just went to allrecipes.com and found a few recipes for dried cherries but I'm always looking for more. This is the time of year that I do a little extra cooking so send me your ideas. With the start of a new year and season it is always good to set some goals. I have to preface this with saying that I recently attended a great workshop about customer service. So I'm all pumped up on Customer Service. The Chinese have the Year of the Dog or Monkey, so here at King Orchards we are going to have the "Year of Customer Service". To achieve my goal I'm going to make a video or at the very least a handout to train my employees. I have great workers and I think we have done a pretty good job but I see room for improvements. One advantage here is that I do have a couple of quiet months to rethink my last season and build on the successes and correct the errors. Now that I have documented the "customer service" theme, I'm committed. In fact I'm going to nick name my goal "The Year of Sophie." 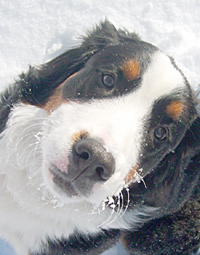 Sophie is our Bernese Mountain dog. She gives the best customer service because she makes everyone think they (the person petting her) are the most important person on earth, and all she wants to do is make you happy. If you would like to contribute with ideas or experiences my e-mail is betsy@kingorchards.com. Use the subject "The Year of Sophie" and I'll be sure to get it. Now that the weather is cooler, we've begun shipping both the Montmorency and Balaton IQF tart cherries. They are in 10 pound containers (I measured this morning, and 10 pounds equates to approximately 8 quarts by volume). The price is $40 plus shipping. The downside: Unless you're in Michigan or the Chicago area, they will require Next Day shipping, and that usually costs more than the cherries themselves. The upside: The IQF cherries are gorgeous and delicious, the very next best thing to fresh off the tree in July. All our apple picking is done for the season, but we have plenty of apples in the fruit stand, and expect to have them until Christmas. Stop in the M-88 market for Galas, Honeycrisp, Ida Reds, Mutsus, Empires and Jonagolds. We also have Bosc pears, pie pumpkins, and squash - plenty of good fixin's to add to your Thanksgiving feast. Here's a hint: Try tossing some dried tart cherries into your stuffing or favorite side recipe - according to John, dried cherries turn ordinary stuffing into "an event!" What a great week-end to come out to the orchards. We have u-pick on the McIntosh and Gala apples. In the market we have McIntosh, Gala, Cortland, Bartlett pears, Stanley prune plums along with the last of the Ginger Golds. We have raspberries for u-pick. Sweet corn that is the best of the season despite the few worms on the tips. Fresh pies and donuts. All served up with a smile from our help. I think our Indian summer is this week-end so come out for a look at the orchard! Honeycrisp, Macs, and Galas... oh My! There's lots of good apple news to report this week. The honeycrisp is here in all its crispy glory. They are such a pretty apple, with a unique flavor that truly is reminiscent of honey. We have lots of other premium apple varieties, too. The Gala, for instance, is a wonderful snack apple, crunchy & sweet, perfect in kids' lunchboxes, and a good "cooker," too. We're also seeing our first Cortlands. These are very nice for snacks and salads, plus they have the lovely quality of not turning brown upon cutting. This translates to "goes great with peanut butter." And of course, we have the venerable McIntosh, considered by many to be the best apple ever. Did you see John and Jésus on the front page of the Record Eagle last Sunday? We're pretty excited around here. It's not just good news for King Orchards and Michigan apples; it's darned refreshing to see a positive story make front page news for a change. 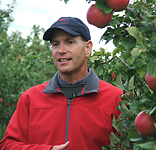 Mark Doherty, our favorite horticulturist and partner in apple growing, has been appointed Chairman of the Michigan Apple Committee. Mark was on hand, along with John and Jim King, when Dianne Stampfler of Promote Michigan picked up King Orchards apples for the "Check in to Michigan Apples" promotion, which provides hotel guests with a free apple at check-in and encourages them to explore local orchards and farm markets. Kimberly Purdy of 9and10 News covered that story, which can be viewed here. You have to see the size of our Ginger Gold apples this year - they're huge! Crisp, sweet and juicy, they are one of our favorite fresh eating apples. If you're interested in an early baking and sauce apple, we have Paula Reds in the market, too. Try serving this simple taffy dip with your apples this season. It's a definite crowd pleaser. Soften cream cheese. Mix in 3/4 cup brown sugar & 1 tsp vanilla. Add nuts if desired. Serve with crisp, fresh-cut Ginger Gold apples. The college crew is heading back to school, and our thoughts are starting to turn to fall. We have winter squash starting to trickle in to the markets. The pumpkins are starting to show some orange, and so are we. Frank is returning as a senior lineman to the Central Lake Trojans, and Mike is playing Junior Varsity quarterback. Go Orange and Blue! We've finished u-picking the Red Haven peaches, nectarines and apricots. We still have them for sale in the fruitstands, hopefully for another week yet, but they are going quickly. Red Haven peaches should be ready for this weekend, so get those kettles and jars ready! It's hard to motivate in this heat, so think winter, and how satisfying it will be to open up a bright sunny taste of summer next February when all is dark and dreary. We have plenty of peaches, nectarines, plums and apricots now, and we're looking forward to having raspberries again soon. There are lots of berries out there, but they're slow to ripen because of the drought. The corn is a little smaller than usual, but what it lacks in size, it more than makes up for in great taste. We've been getting the first of our beans and pickling cucumbers in, along with summer squash and fresh eating tomatoes. Pie pumpkins are sizing up remarkably well. If you're looking for quick summer dessert for family and guests, consider a delicious homemade pie from our King Orchards bakery. It's our final week for fresh blueberry pies; we also have apple, peach and, of course, Rose's famous tart cherry pie, as featured in Parade Magazine. With this prolonged drought, irrigation has really helped to size up our peaches. Jim's had it running 24/7 since May 1st, but even that's not keeping up with this drought, so he's ordering more. In addition to helping size up the fruit, the extra irrigation helps to keep the trees from being stressed from lack of water. The apricot crop is very hard to predict. Our first picking was very brief. Our next variety should come ripe by the end of the week, July 28th or so. How long will the season last? Perhaps until mid-August is our best guess right now. Around the 1st of August, we'll have the Garnet Beauty, a semi-cling peach that is great for fresh eating. Red Havens will be ripe around the 10th. They are early, so plan on canning your peaches in August this year. By Labor Day, they're likely to be gone. The nectarines look like they'll be ready around the 10th of August, along with the Red Haven peaches. Our first quality apple should be ripe for Labor Day. We have excellent Bay City Michigan sweet corn in the markets right now. Ours will hopefully be ready by the 1st of August. We need rain! Our Bay City farmer is telling us to look for them between the 1st and 5th of August. The black sweet cherries are of such great quality this year that we were able to load up our coolers, and should have them available in the markets for 2 weeks yet. We'll have the Montmorency tart cherries fresh in the market until Thursday. We're pitting and freezing Monts into tubs & 10 pound boxes for later use. We expect to have blueberries for two more weeks. Beth just came in the office to tell us the apricots are in, and they are delicious! We should have u-pick apricots this weekend, around the 20th, but we expect it to be a short season. We're in the final days of u-pick sweet cherries. There's still some good picking, if you're willing to do a little work for them. The tart cherries are still going strong, and we plan to have u-pick open for them through the 25th. Raspberries are very good right now, too. Pick a pint for $4 or a quart for $7. Sweet cherries are ready for u-picking. As we predicted, it's a large and beautiful crop. The quality is really great, despite the fact that we've had little or no rain. We have the pitter running now, so we're ready for an early tart cherry season, too. We're expecting to begin picking the tarts around the 9th or 10th. We also have raspberries ready for picking, plus we have blueberries here in the market. Don't forget to come by for one of Rose's delicious homemade pies. She's baking cherry, cherry-raspberry, blueberry, and apple-caramel, in addition to cookies, tarts and muffins. See you soon! It is warm for the next three days and we are getting our plans started to let people know about the big and beautiful sweet cherry crop we have ahead. First, we have trimmed the trees to let the sunshine get down to the reachable cherries, so we'll have plenty of quality fruit for the u-pickers. Next, we have the irrigation running. It's not as good as rain, but better than dry. Last but not least, I'm lining up the buckets, maps and signs to help ensure u-picking is successful. Most importantly we are getting excited for the season! Our new thought is to have walking tours offered thoughout the summer. Just 15 minute talks about whats happening on the farm. For those who wonder what we do all day, check out our tour. This week we have our first meeting the the National Cherry Festial. This year the festival runs July 7-14th. This is great timing since our sweet cherries will be ripe!!!!! Gosh - all this talking makes me think I better quit and get to work. Remember July for sweet cherry picking. It is a beautiful warm day here at King Orchards. The cherry crops are looking beautiful. It was touch and go there for a few nights last week, as they were calling for overnight frosts. We had the wind machines ready to roll, just in case, but were fortunate not to have needed them. Asparagus---I personally have steamed, grilled, sauted in olive oil, soy sauce and butter, souped it, and casseroled it. Every way was delicious! Our farm yard is just about cleaned up from the turkey manure. The trees are happy and healthy after their annual turkey manure dosage for fertilizer. Today the bees are busy in the last of the apples. Pedro and Jesus and starting to thin peaches. This is a very time consuming job. Every branch of every tree needs to be gone over by hand to thin the fruit. Another job on the front burner is mowing. Josh is getting quite a nice tan sitting on the tractor all day. I'm off to enjoy some of this wonderful sunshine myself. Shucks!!! That is the word of the day. The tiny new fruit is coming out of the blossom casing. This is called "the shucks". That's exciting because we can see the fruit and the crop looks great! There is still so much to do, we feel behind in our work. The whole orchard needs mowing. Jack is just about done with the hedging, where we cut off the tips of the tart cherry trees. Our corn is planted and the gardens are close. The bee's work is just about done and the bee man will come and take the hives away soon. We had very nice pollination weather this year. It is also good baseball weather and our favorite player is Frank King, the catcher. We are having such a great time with the team and parents. In fact I have to dut this short to get to a game. What is that smell? Could it be the 50 tons (I'm not exaggerating!) of turkey poo in our farm yard? I'm glad to say it isn't my job to spread this lovely stuff around the trees. It is a big job, but the trees love it. We are on spring hours now in the market, open Monday through Saturday 9:00 to 5:00. Closed Sunday. We have asparagus!! The asparagus is out of this world. The cherry trees are blossoming and it is a beautiful hillside I'm looking at right now. What is our feel for the season? According to John, "We are poised for a fabulour year." Snow today, but we're thinking spring! I'm moving aside the seed catalogs on my desk to update the web. We have had some warm weather in the past weeks, however, the snow flurries have returned today. It is cold and the tree trimming is on hold until a little better weather. We have our work cut out for us - almost 72 acres of 1 to 4 year old cherry trees that need to be trimmed. I'm excited about some of the seeds we have bought this year. We have top secret pumpkin seeds that will produce big beautiful pumpkins and a revolutionary sweetcorn seed that should knock your socks off. Our big purchases this spring are a New Holland orchard tractor along with a special orchard sprayer. A new manure spreader is also in the yard and that will make our son Jack happy who has been the muscle behind our spreading the turkey manure for fertilizer. This natural method of fertilizing has been a change we have made in the past 5 years. John just told me we have blizzard warnings for today and from the wind outside my window I think it is here. This cold weather does make us nervous. If we get too cold of temperatures there will be a reduction in crops due to freezing. We did make two new wind machines but this do not help in this kind of cold. Let's just hope for the best. Being diversified helps reduce our risk because different fruits are at different stages of development. The college kids are getting ready to come home and I'm hoping that many of them want to come back to work for the summer. Cherry juice is the new super fruit - check out choosecherries.com for info. It is a beautiful winter day here in Northern Michigan. We got half a foot of fresh powder last night. Today, the sun is shining gloriously, turning everything sparkly and bright - A perfect day for playing outside or going skiing. Casey's probably on a frozen lake somewhere, perhaps in Minnesota, doing some ice fishing. Sunny days like today naturally turn our thoughts to the coming spring. John and Jim are buying more trees for spring planting. They have a new plan for an old favorite apple, the Northern Spy: a close planting of the trees on trellises, which John hopes will add both size and good color. It's the King Orchards way, using the best modern growing methods, and constantly improving on our tradition of growing quality fruit. Here are a few of the yummy recipes our neighbors shared. The Cherry Mallow cake was very easy to make, and a big hit here in the office, although we all agreed a second can of cherry pie fill would make it even cherrier. Preheat oven to 350�F. Spray a 13x9x2-inch baking pan with vegetable cooking spray. Place marshmallows evenly in the bottom of the pan. Prepare cake mix according to package directions. Pour batter over marshmallows. Spoon cherry filling evenly over cake batter. Bake for oven 45 to 50 minutes. The top of the cake will be bubbly and the marshmallows will be sticky on top of the cake. Let cool in the pan, then cut into squares. Drain cherries and save juice for sauce. Cream shortening and sugar together until fluffy. Add egg and flavoring and beat well. Sift flour, baking powder, salt and soda together. Add alternately with milk in small amounts, mixing well after each addition. Add cherries. Pour into buttered cake pan and bake in moderate over (350�F) about 45 minutes. Cut into squares and serve with hot Cherry Sauce. Makes 1 (9x9 inch) cake.